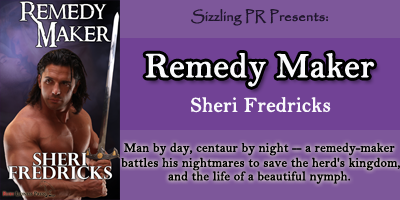 Blurb: Man by day, Centaur by night, Rhycious is a remedy maker who needs his own healing. He's the royal physician, famous for his cures. War and posttraumatic stress disorder has broken his spirit, preventing him from finding true happiness. Then a direct order from the queen to investigate an uprising forces him out of his secluded cabin at the edge of the forest. Patience is an optimistic, good-natured Wood Nymph who works as a mediator to ensure harmony within the Nymph sector. Environmental pollution in the aquifer stream that feeds the taproot tree of her heart is slowly killing her. Resigned to the fact she will not live long, she sets out to discover the mysterious disappearance of her sister. 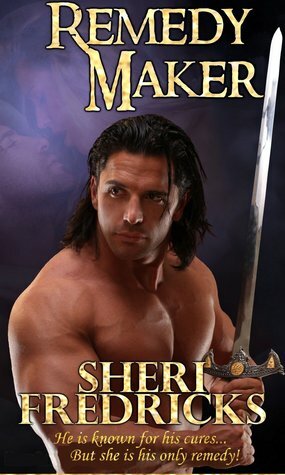 Experience has taught her to deny herself the love of a male, but the gruff Centaur is different. He doesn't push his expectations on her, only his healing nature. When Rhycious loses his grip on reality, he believes his inability to control his disorder will drive Patience away. Nevertheless, desire flares, and Patience draws him close. Kidnapping and betrayal turn their mythic joint venture into a deadly bout. Will their love endure when survival hinges on trusting each other? 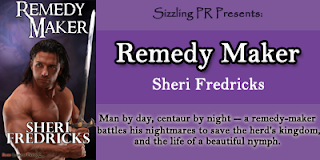 About the author: Always on the hunt for the uncommon things in life, author Sheri Fredricks thrives on creating adventures in her mythological kingdom for her readers.